Ally: What was the inspiration for the Elfy books? BARB: My inspiration comes from three places. One was my late husband Michael, who was one of the most encouraging people I’ve ever been around. The second was an anthology I read — I now can’t remember the name of it — where the editor said something to the effect that the stories in that antho wouldn’t be “the normal Elfie-welfie stuff.” And the third was a dream I had after that, where a short young man dressed all in black came to me and said, “It’s not like that!” and proceeded to tell me just what Elfy-welfie stuff was (yes, he insisted on the change from -ie to -y) and why he wanted no part of it, thanks. I woke up from that dream, not long after my honeymoon, and told Michael about it. Rather than looking at me like I was an idiot, as I would assume most men would do, he said, “Well, then. You have to write about this, and figure out who this guy is, now, don’t you?” with a big smile on his face. And I proceeded to do just that. Now, if you are a fan of Twilight Times Books, you are probably aware that both Maria DeVivo and Christine Amsden are TTB authors. Maria’s most recent book is THE RISE OF STURD, a fantasy with both dark and comedic elements set in her Coal Elf series; Christine’s most recent book is KAITLIN’S TALE. They’re both fine authors and I’m proud to say that I’ve helped to edit their books in the past — Maria with THE COAL ELF, and Christine with KAITLIN’S TALE. I’ve “met” authors Uvi Poznansky and Dellani Oakes to a degree online; they’re both very warm-hearted people with some interesting books and stories. Everyone else, I’ll be meeting for the first time along with you…but we all intend to give you a fun-filled day filled with contests, prizes, and much more. Now, as to what I, personally, will do? You need to show up to the online party to figure that out, but I will give you a couple of hints…the year 2002 may factor into the discussion. (Just sayin’.) Perhaps my favorite authors will be discussed…and, finally, I may discuss the environs of Northern California just a tad, if I feel the need. In case you want to get into the Xmas in July spirit and buy one of my books now, here are the links to both of my novels at Amazon; each are e-books. …and A LITTLE ELFY IN BIG TROUBLE is here. Oh, you want to try before you buy? I guess I can understand that…here’s the link to TTB’s sample chapters for AN ELFY ON THE LOOSE, and here is the link to the sample chapters for A LITTLE ELFY IN BIG TROUBLE. Now, let’s get ready to rumble…er, read! Folks, it’s my fourteenth wedding anniversary today, as I write this. (Actually, it’s nearly over, as it’s after eleven p.m. as I type this out.) And while I’m happy to remember my late husband Michael, and the happiest day of my life — our wedding day — spending my anniversary alone, again, is not the world’s most pleasant thing. Grief is a very strange thing, you see. It’s a personal journey of sorts; how well can you cope with the pain? How well can you go on with your life, and all its vicissitudes, and yet do your best to honor your loved ones…honor your memories? Every person’s grief-journey is different. Mine has been long, protracted, and difficult, but along the way I’ve met many wonderful people and reaffirmed long-standing friendships. I talk about Michael with my friends, and about how much I miss him, and about how much he did to help me as a writer and editor…and also about how much he enjoyed listening to me play my instruments (usually I played my clarinet, sometimes the alto sax), or discussing the music I was writing, or really anything at all. Michael enjoyed so many things, you see. He was a strong, vibrant presence, even though he, of course, did not see himself that way. I’m glad to have met him, married him, and been together with him until he passed — way too soon — in 2004. I will honor our wedding day every day of my life, but most especially on our anniversary. My publisher has priced AN ELFY ON THE LOOSE at ninety-nine cents, so it’s quite affordable. And if you enjoy that, you can go grab A LITTLE ELFY IN BIG TROUBLE for only $2.99 — the two together are less than the price of most fast-food hamburger meals, and are far more satisfying (with far fewer empty calories, too). TO SURVIVE THE MAELSTROM is a novella featuring Peter Welmsley, one of the few survivors of the Battle of Hunin. How can he continue to live while his best friend, much less his fiancée as well, are dead? And what does an empathic were-mouse have to do with Peter, anyway? Note that the Marketing for Romance Writers Group on Goodreads featured TO SURVIVE THE MAELSTROM as its book of the week for June 21, 2016…thank you so much for that! Next is Michael’s fantasy-romance novella COLUMBA AND THE CAT. This story features Princess Columba of Illnowa; she does not want to be a princess, as she’s suited to be a musician-sorceress instead. She’s been looking around for a familiar animal — someone to help her with her mage-studies — and happens across a small cat with unusual markings while out riding. She rescues the cat, and then magical things start to happen…including dreams of a near-perfect suitor (not young, not overly handsome, but smart and funny and interesting). But the cat is a shapeshifter…when, oh when, will Columba figure that out? And, finally, there are the two stories of spaceman and adventurer Joey Maverick, written by Michael (with the second story being finished and expanded by me), A DARK AND STORMY NIGHT and ON WESTMOUNT STATION. Folks, right now, Twilight Times Books has a ninety-nine cents sale going on. Books included in this sale are my own AN ELFY ON THE LOOSE, Jason Cordova’s CORRUPTOR, Chris Nuttall’s SCHOOLED IN MAGIC, Loren Jones’ STORIES OF THE CONFEDERATED STAR SYSTEMS, and much, much more. If you ever want to see what’s going on with Twilight Times Books, here’s a link to the Amazon page: http://amzn.to/eYYy6s Once you get to this page, click the box that says, “Price low to high,” and you’ll see all sorts of great books available for only ninety-nine cents. Because this is my page, though, I’m going to tell you a little more about my own offering that’s on sale right now, AN ELFY ON THE LOOSE. This is the first half of the Elfy duology (the second half being A LITTLE ELFY IN BIG TROUBLE, available right now for $2.99). Bruno the Elfy is taken out of his own culture and place, the Elfy Realm, and is brought to our Earth. He doesn’t entirely know why he’s here. He doesn’t know why a strange family from Northern California has kidnapped him. But he does know that the young daughter of that family, Sarah, intrigues him. Both are treated horribly, and both decide they’re going to leave…contacting Bruno’s mentor, Roberto the Wise, they attempt to get out of there, with Roberto ending up trapped in Bruno’s place instead. As Bruno and Sarah attempt to gather allies, they find out more about each other than they’d ever believed possible…and that much of what they thought they knew about themselves was flat wrong. I’m proud of writing AN ELFY ON THE LOOSE, and I hope you will enjoy reading it. 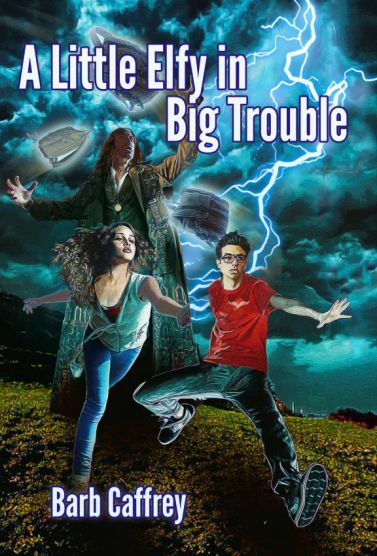 As it’s on sale right now, there’s no better time to dip your toe into the water of the Elfyverse than right now…and since the second half of the Elfy duology, A LITTLE ELFY IN BIG TROUBLE, is only $2.99, you can have a great, multi-day reading experience for less than the price of a tall latte at Starbucks.